Starting all the way back in 2013, Sony Pictures has been wanting to establish their own shared-universe with their comic-book properties. Many projects were put into development, some of which were “The Amazing Spider-Man 3,” “Sinister-Six” and “Aunt May.” However, since “The Amazing Spider-Man 2” didn’t receive the box office results the company was expecting, they decided to scrap all of the projects lined up and led to their cancellation. The bond between Eddie and Venom is the highlight of the entire film. Their relationship received many laughs and fun in my theater. 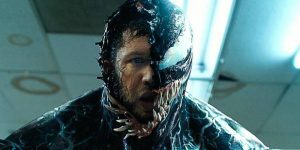 “Venom” is the first film out the gate to begin this new franchise. 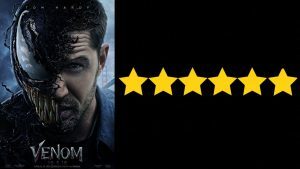 The film stars Tom Hardy, Michelle Williams and Riz Ahmed. It’s directed by Ruben Fleischer, who has previously worked on 2009’s “Zombieland” and 2013’s “Gangster Squad.” So, how did the film do? Let’s talk about it. Before we begin, let me state that there will be no spoilers in this review and discussion. “We are Venom.” Tom Hardy, who plays Eddie Brock, provided the sinister deep voice to the alien symbiote. 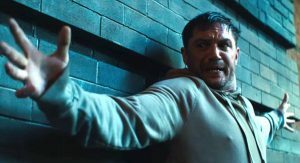 “Venom” centers around journalist Eddie Brock (played by Tom Hardy), trying to find any way possible to take down Carlton Drake (played by Riz Ahmed), who is the founder of the Life Foundation. When he accidentally merges with one of Carlton’s experiments, Eddie finds himself with superhuman strength and power with a twisted alien life-form living inside of him. This life form’s name: Venom. Venom, in the comics, is a sinister and evil villain. In the film, he acts as an anti-hero and lethal protector. 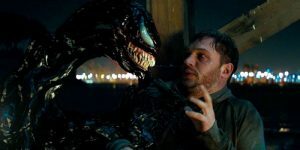 In terms of what I liked, the relationship between Eddie and Venom is the highlight of the entire film. It felt genuine and possessed a “Jekyll and Hyde” type of bond. Also, some of the humor and action worked very well. There is an extremely funny scene involving the two of them that had everyone laughing in my theater. Furthermore, the score and music were great and added a lot to the film; particularly during the action sequences. The biggest question and debate about this film is this: Does it work under a PG-13 rating? The answer is yes and no. From an action standpoint, it works. The action is what I wanted from this movie regardless of the rating. However, from a humor standpoint, it really would have benefited from an R rating. There are lots of times where I can see the director wanted to use more R-rated humor and I believe it would have helped a lot. From the cheesy dialogue and story elements, this is a 90s superhero-type flick. Even with its flaws, I had some fun with what was presented. As it is, I have to admit that I found myself having some fun with it despite its flaws and problems. But, as someone who wasn’t all that interested in seeing this movie, I was a little surprised with what I saw. It works as a 90s superhero flick, from its cheesy dialogue to its engaging soundtrack. If you view it that way, I think you can have some fun with this, and I personally wouldn’t mind seeing a sequel. And based on how much it made on opening weekend (which was $200 million total), it looks like this won’t be the last time we see Eddie and his alien symbiote. Let me know in the comments what you guys thought about “Venom” and what you would want to see in the sequel. I completely agree with you, Venom was done very well as a character. However the film had fundamental issues with editing and story.